In 1859, the all-white volunteer fire department of Victoria, British Columbia refused blacks in their ranks. 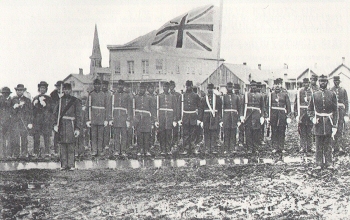 Therefore, some blacks volunteered their services to Governor James Douglas as a militia unit. Concerns over an imminent Indian War and a dispute between Britain and the United States over the San Juan Islands influenced Douglas to accept the offer of a volunteer militia unit that was sponsored by a prominent black merchant, Mifflin Gibbs. It is believed that many members of VPRC returned to the USA after the Civil War ended in 1865. Some members of the corps were: E.A. Booth (Paymaster), W. Brown, R. Caesar (Sergeant), P. Carter, A.H. Frances, R.H. Johnson (Captain), J.B. Johnson (2nd Lieutenant), A.C. Richards (Secretary), F. Richards (Captain), and S.A. Stevens (Corporal). Paris Carter, who came to British Columbia in 1856, is the only known member of the Victoria Pioneer Rifle Company to be buried in Ross Bay Cemetery, Victoria. A Resource Guide on Black Pioneers in British Columbia. (Victoria, B.C: The British Columbia Black History Awareness Society,1997).